Newhaven harbour breakwater on a calm sunny day (27-01-2007) The lighthouse is unmanned. We thank you the contributors for your photos and comments! 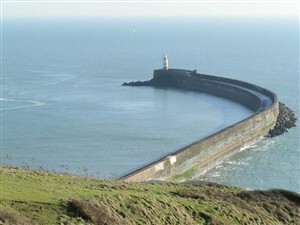 The photo of Newhaven harbour breakwater on the home page of this website is reproduced by kind permission of rileycars on Flickr. We are grateful to Newhaven Historical Society for the permission to use some of their photographs, including the private collections of Rob Robson Snr & his neice, Mrs Mary Morgan. Additionally, we are grateful to Paul Smith of www.mainlymono.co.uk for use of some of his wonderful collection of photographs. 2008: 'Our Newhaven' started as a NSN partnership project led by South Downs Council for Voluntary Service with Tideway School, Newhaven Town Council, Newhaven Historical Society, Newhaven Fort, Newhaven Community Development Association and WRVS Heritage Plus, and the website project was supported by ESCC Global Grants programme. Newhaven Town Council, WRVS Heritage Plus & Newhaven Chamber of Commerce sponsored the publicity banners. Our Newhaven "Dramatised story" & "The Living History" Day at Newhaven Fort (21st March 2008) was supported by a grant from Awards for All. 2009: Managed by local volunteers, and led by a newly formed committee. We published a 2010 calendar with grant monies from Newhaven Town Council. 2010: Managed by local volunteers, and led by committee. We purchased a laptop, scanner and printer with a grant from Grassroots, and a display table from a grant from Rotary. We received a grant from Newhaven Town Council towards the cost of a projector. 2011: We have received a grant from Newhaven Town Council towards the hosting cost of our website. This page was added by Jack Latimer on 05/07/2007. A beautiful view taken from near the NCI (National Coastwatch) lookout tower. NCI are always looking for new volunteers to join as Watchkeepers, full training is given, nice bunch of people doing their bit and giving something back to the community. Why not join us - call the lookout on 01273 516464 for further details.